"饼" redirects here. For the web search engine, see Bing (search engine). For other uses, see Bing (disambiguation). Bing is a wheat flour-based Chinese food with a flattened or disk-like shape, similar to the French concept of a galette. These foods may resemble the flatbreads, pancakes and unleavened dough foods of non-Chinese and western cuisines. Many of them are similar to the Indian roti, French crêpes, or Mexican tortilla, while others are more similar to Western cakes and cookies. 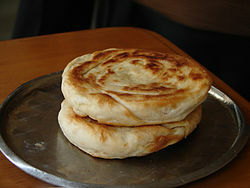 The term is Chinese but may also refer to flatbreads or cakes of other cultures. The crêpe and the pizza, for instance, are referred to as keli bing (可麗餅) and pisa bing (披薩餅) respectively, based on the sound of their Western names and the flour tortilla is known as Mexican thin bing (墨西哥薄餅) based on its country of origin. Bing are usually a casual food and generally eaten for lunch, but they can also be incorporated into formal meals. Both Peking duck and moo shu pork are rolled up in thin wheat flour bao bing with scallions and sweet bean sauce or hoisin sauce. Bing may also have a filling such as ground meat. Bing are commonly cooked on a skillet or griddle although some are baked. Chun bing (春餅; spring pancake), a thin, Northern bing traditionally eaten to celebrate the beginning of spring. Usually eaten with a variety of fillings. Jian bing (煎餅; fried egg pancake, similar to crepes), and a popular breakfast streetfood in China. Bó bǐng (薄饼; literally "thin pancakes") refers to a thin circular crepe-like wrapper or "skin" (薄餅皮) wrapping various fillings. This is sometimes called "Mandarin pancake" or "moo shu pancake" (木须饼, mù xū bǐng) in American Chinese food contexts. Rou jia bing (肉夹饼), also called rou jia mo refers to a bing that is sliced open and filled with meat, typically stewed pork or lamb meat. Some variants, such as niu rou jia bing(牛肉夹饼) use sesame bread and are filled with beef meat and pickled carrots and daikon, similar to a banh mi. Hé yè bǐng (荷叶饼; a foldable bing made to represent a lotus leaf), used to accompany many rich meat stuffings and popularized by the gua bao, a variation with red-cooked pork belly. The Yuèbǐng (月餅; mooncakes), whilst sharing the name bing, is really a baked sweet pastry usually produced and eaten at the mid-autumn festival. Some other dessert bings are "Wife" cake (老婆饼), which contains winter melon, and the sweetened version of 1000 layer cake (千层饼) which contains tianmianjiang, sugar, and five spice or cinnamon. Bings are also eaten in Korean culture, the most common being Jeon (hangul:전, hanja:煎 zh:jian (jianbing)) which often contain seafood. This page was last edited on 18 September 2018, at 01:25 (UTC).